State AND U.S. Record Low Broken in Alaska? An Alaska Department of Transportation thermometer recorded a reading of 79 degrees below zero at Jim's River on Saturday morning, then mysteriously stopped transmitting. The state and U.S. record low temperature is -80 at Prospect Creek Camp set on January 23, 1971. Here is a link to an article from accuweather.com discussing the possible "record-setting temperature that wasn't." The article also mentions the disputed reading from Rochelle in 2009 that would have been a new record low for Illinois. The mercury dropped to -38F in Rochelle on January 16, 2009. This would have broken the state record low temperature of -36F set in Congerville on January 5, 1999. Here is more on the Rochelle reading. While we'll continue to enjoy April like weather at the end of January, mother nature may have something up her sleeve in regards to the weekend storm. A surface low pressure system will develop later in the week in response to a cut-off low that will be spinning in the southwest within the southern branch of the jet stream. At the same time, a trough of low pressure will be moving through the northern Plains and Midwest within the northern branch. Just where and how quickly these two branches of the jet stream phase, or come together, will determine where the surface low tracks. Right now model guidance is all over the place with the storm track heading into the weekend. The GFS, the National Weather Service model, has been trending slower and further west with the low. It develops the surface low near the Texas/Oklahoma panhandles and lifts it northeast through Missouri and into central Illinois. This track would yield the heaviest snow band setting up either on or very close to the Stateline. In fact, the raw model data from this morning's GFS run has a whopping 8.7" of snow! Yikes! The latest run of the GEM model (Canadian model) develops the surface low roughly in the same location, but lifts it further north keeping the heaviest of the snow accumulations just to our northwest. This track would probably yield more mixed precipitation. The European model, again, develops the surface low around the same area but tracks it well south of the Stateline. A few snow showers could be found but nothing to get excited about. So, what is going to happen this weekend? A lot of this storm track depends on how the two jet stream branches phase. It seems as if the trend this winter has been for storms to take more of a northerly track bringing us more rainfall than snow. Now, that's not to say that this one will go further south and bring us 8" of snow but it's definitely worth watching if you have plans for the weekend. Did you feel it last night? A minor earthquake (M2.4) occurred around 9:54pm in McHenry County. The epicenter was located about 10 miles south of Twin Lakes, WI. There were a few reports of shaking reported to the USGS in western Kenosha and eastern Walworth counties. There were also a few in far northern Illinois. No damage was reported as earthquakes of that magnitude are weak. A record high temperature was tied today at the Rockford Airport. The mercury climbed to 52 degrees at 3:22pm this afternoon. This tied a record high that was also set in 1944 and 1926. Today's high temperature was 22 degrees above our average high of 30. The unseasonably mild weather will continue tomorrow, despite more cloud cover and a chance of drizzle and light rain in the afternoon. We're thinking our high will reach 49 in Rockford. Tomorrow's record high of 63 set back in 1989 should still stand. What little snow cover we have will continue to melt away as the mercury rises into the 40s the next several days. The first image on the left shows the current snow depth across the Midwest. Most locations in north-central Illinois and south-central Wisconsin have anywhere between 2" to 4" of snow remaining on the ground, with an inch or less further east and south. With the southerly winds expected the next couple of days the snow pack will continue to dwindle, which will aid in the warming trend through the remainder of the week. 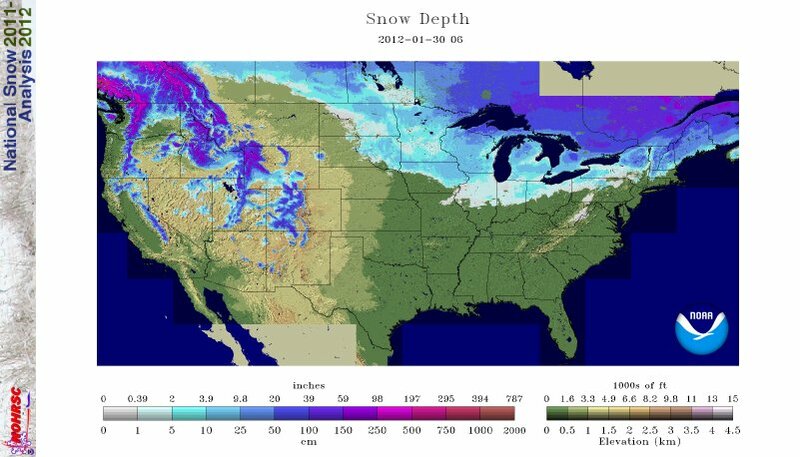 Just a little over 15.5% of the U.S. is covered with snow, but what I find very interesting is that the snow depth across the upper Midwest and far northern Plains really isn't that deep; with the exception of the lake effect regions. This shows that even though we've had some cold days in the past couple weeks, that air mass was modified a bit as it moved south. We truly haven't had a big arctic outbreak like we have in years past. It's all been bottled to the north across Alaska where temperatures have been well below zero for almost the entire month of January in the interior part of the state. A bubble of high pressure will allow for a quick drop of temperatures into the teens early tonight, but clouds will move in from the west and stabilize temperatures. With a warm front approaching from the plains temperatures will rise back into the 20's before daybreak. There could be some snow flurries after midnight. On Monday there could be some early morning freezing drizzle and flurries before temperatures rise above freezing around 9 am. The warm front will lift northward into Wisconsin, it will become mostly sunny, and the afternoon will be unseasonably mild with a high in the low to mid 40's. It will be breezy by mid afternoon with southwesterly winds 15-24 mph. A good mild southwesterly breeze will continue overnight limiting the overnight temperature fall. Low's will be very mild for this time of year... in the middle 30's. The southwesterly winds will be on going Tuesday morning with a chance of drizzle. It will be very mild in the afternoon with a high in the upper 40's, along with a chance of light rain. The next Pacific type of cool front will push eastward across the area during the early evening. A large Pacific high pressure will be centered over the Rockies, and ridge easward into the midwest. The low on Tuesday night will be around 30, and the high on Wednesday will be in the low 40's under partly cloudy skies. There will not be much change Thursday, but a new weather system will approach from the west on Thursday night. There will be a slight chance of a little light snow on Thursday night, Friday, and Friday night. It will turn a little cooler on Friday with a high in the upper 30's, and the cooling will continue on Saturday, and Sunday with highs in the lower 30's. Sunday will be mostly sunny. A fast moving weather system is approaching from the northern plains this evening. An impulse crossed northern Illinois around 8 pm causing brief moderate snow. An upper impulse associated with a Canadian cold front will approach the area later tonight. A brief period of light to moderate snow will move across the area late tonight bringing around 1" of new snow to northern Illinois. Light snow and flurries will end early Sunday, after the upper disturbance moves off to the east, followed by decreasing clouds. It will be breezy during the mid-day hours, and it will be a little chilly with a high temperature in the upper 20's. A ridge of high pressure will make for mostly sunny skies and decreasing winds by late afternoon. The ridge will move to the east of the Stateline by early evening. It will be mostly clear to start off the night, but clouds will rapidly increase with a warm front approaching from the west. The warm front will move northeast through northern Illinois by noon time on Monday. Monday will be mostly cloudy and warmer with a chance of some drizzle in the morning. The high temperature on Monday will be back in the low 40's with a breezy southwesterly wind blowing from 15-25 mph. Temperatures will be well above average on Monday night with a mild low in the low 30's expected. On Tuesday the southwesterly breezes will continue, and the temperatures will soar into the upper 40's in the afternoon. There may be some rain showers in the afternoon with the mild moist air from the southwest pushed upward by a Pacific cool front moving in from the west. There could be a little rain and snow on Tuesday night after frontal passage. Wednesday will be partly cloudy and continued mild with a high in the low 40's. Pacific high pressure centered over the Rockies will ridge eastward into the mid west on Thursday and Friday keeping temperatures mild. Highs both days will be around 40 degrees. A disturbance could cause a little light snow on Friday night. Saturday will be partly cloudy and a little cooler with a high in the middle 30's. A Pacific system will move across the area tonight with frontal passage around midnight. There is enough moisture with the system so that it may generate a little snow, but only about 1/2" is expected. Drier air will follow in right behind the front shutting down the precipitation. A brisk breeze will set up across the area late tonight with winds gusting to 25 mph. Skies will start out mostly sunny on Saturday, but become partly cloudy in the afternoon. It will be windy with westerly winds 15-25 mph with gusts to 35 mph, and the high temperature will be in the low 30's A fast moving Alberta Clipper System will approach out of the northern plains on Saturday evening increasing the clouds after dark, and bring the Stateline a chance of light snow overnight. It will be quite breezy on Sunday morning with a brief shot of colder Canadian air. It will be breezy through mid-day when the wind should diminish. The afternoon high temperature will be around 27 degrees. That cool bubble will push quickly off to the east with a warm front stretching from the southern tip of Illinois northwest across the Dakotas into southwestern Canada by 6 am on Monday. The front will push northeast across the area on Monday raising temperatures back to around 40 degrees by Monday afternoon. The mild air from the plains will be in place on Tuesday, so our region can once again expect a high in the 40's under mostly cloudy skies with a chance of some light rain showers. The next Pacific cool front will move through the Stateline on Tuesday night, and temperatures will be mild with a low around freezing along with a chance of a little light rain or snow. There will not be much of drop in temperatures on Wednesday. Keep in mind that the air behind the front originated over the Pacific ocean. The high on Wednesday will once again reach 40 degrees, even though the average high this time of year is in the low 30's. There still is not any severe cold arctic cold air in sight. First, I want to start with the forecast for this weekend. A weak clipper system moving through the Midwest late this morning has been spreading light snow across central/north-central Iowa northward through Minnesota. That system will move east through the remainder of the afternoon and likely bring light snow to the Stateline this evening and overnight. Accumulations will range from 1" to 2" inches. Winds will pick up tonight from the west and continue into Saturday and Sunday. 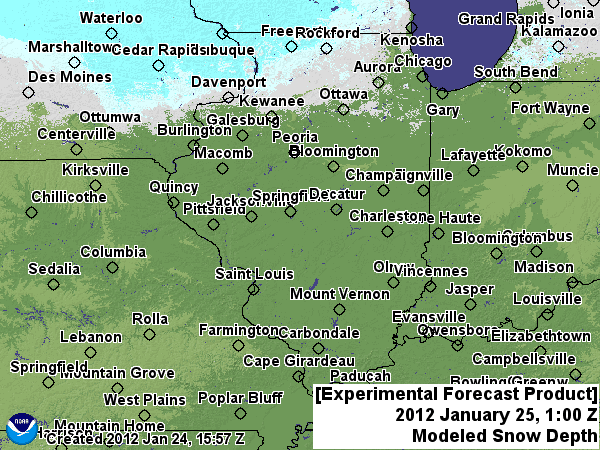 Another weak clipper system will move through Wisconsin overnight Saturday and could bring a few flurries early Sunday. Temperatures Saturday will be near 30° and temperatures Sunday will be in the middle 20s. A warm front will lift north late Sunday and early into Monday. Clouds will likely move in with the threat for a wintry mix along and ahead of the warm front early Monday morning north and northwest of Rockford. Once the front passes temperatures will warm into the upper 30s and even lower 40s! This is largely due to the fact that there really won't be much snow cover on the ground to keep our atmosphere cool. So the southerly wind should be able to warm us nicely. Now, not only are our daily temperatures expected to warm next week but the average highs have already started to go up. The average high January 22nd was 29° and on the 23rd it rose to 30°. The average will remain 30° through the rest of January before rising to 31° the first of February. Average highs will continue to rise through July before slowly falling in August. Worthless Ag degrees? What do you think? This article was written in response to the recent Yahoo Blog post regarding useless degrees. As a person with a farming background, I find this very interesting and true! In light of misleading recent published articles, AgCareers.com wanted to share some current statistics regarding education and careers in agriculture. The value of agriculture-related degrees cannot be underestimated. No other industry can feed the world’s population that is growing at a rate where we cannot produce enough food for the number of people. According to research (Feedstuffs, October 26, 2009) our food production must double by 2050. To do that, graduates in degree programs such as agriculture, horticulture and animal science are needed. According to the latest data from AgCareers.com, 81% of jobs in the ag industry require education beyond high school and almost half require at least a bachelor’s degree. According to the AgCareers.com/ AgrowKnowledge Enrollment and Employment Outlook Report in 2008 there was a deficit of 9,317 graduates with agriculture degrees to fill open positions in the US. The USDA also estimates there are or will be 54,400 annual openings for individuals with baccalaureate or higher degrees in food, renewable energy, and environmental specialties between 2010 and 2015. Although U.S. unemployment rates remained high in 2011, AgCareers.com experienced a significant increase in jobs posted on the site. In 2011, AgCareers.com had almost 40,000 job openings posted in the United States (up 16% from the previous year). That is more than 3,300 agriculture-related job openings each month. Agriculture positions are not only production-based, but encompass a broad range such as sales representatives, research scientists, quality assurance, marketing and engineers, just to name a few. People may also be surprised to find out that the average starting salary for a graduate in the ag industry is almost $49,000 (according to the AgCareers.com/ AgrowKnowledge Enrollment and Employment Outlook Report and the AgCareers.com Compensation Benchmark Review). Job seekers also feel the agriculture industry is more stable (46%) or as stable (41%) as other industries, according to the last AgCareers.com Job Seeker Survey. For those of us inside the agriculture industry, it is easy to recognize that our careers are rewarding, however we need to do a better job of sharing this with our network and mainstream media. The general public views ag employment as hard work with little pay and limited opportunities as noted by job seekers in the last survey, but we all know this is NOT the case. We encourage you to spread the word of the fantastic opportunities in ag. Please share this with your “friends” and “followers” via social media, and post your feedback on the AgCareers.com Facebook, Twitter and LinkedIn sites! Just as I finished typing this, the Quad Cities NWS extended the Dense Fog Advisory through noon for our northwest Illinois counties. Update: The Dense Fog Advisory for Stephenson, Jo Daviess, Carroll and Whiteside counties until 11:15am. The Dense Fog Advisory for Green, Rock and Walworth counties has also been extended to 10am. I wouldn't be suprised if these advisories were extended even further into the afternoon. The fog has been very slow to lift this morning and has been reducing visibility to a quarter mile in many locations. Temperatures remain at or slightly below freezing so freezing fog along with freezing drizzle has been reported. According to the Quad Cities NWS there have been numerous accidents or vehicles that have slid off the road...especially on highway 61 between the Quad Cities and Dubuque. A Dense Fog Advisory has been issued for northern Illinois and southern Wisconsin lasting through mid-morning. Visibility all across the area has dropped to a half mile or less as a weak ridge of high pressure resides just to our south. Winds will eventually begin to pick up later today and this should help allow some of the fog to dissipate going into the afternoon. Watch for slick spots as well this morning. There have been reports of freezing fog near Freeport, Galena, Savanna and Monroe. This may cause elevated surfaces like bridges and overpasses to become slick. With temperatures already approaching the dewpoint in many parts of the Stateline, fog is beginning to form. Visibilities are generally in the 2-4 mile range still, so the fog isn't a big hindrance to travel just yet. However, the fog has the potential to thicken overnight as the air continues to cool, which will in turn give us more condensation. So drivers should be sure to use their low-beam headlights early tomorrow morning! The fog should dissipate by 9am as southwesterly winds increase ahead of a cold front. Potentially more snow on the way? We've got a series of clipper type systems that are basically going to move through every day for the remainder of this week. The first is currently moving through the Midwest and has brought some light snow across northern Wisconsin and Minnesota while we've been dealing with a little haze and fog this morning. It's possible that as this upper level disturbance moves in we may see a light mix or even a few light flurries early this afternoon, but I believe the atmosphere may be too dry to support any of this reaching the ground. The second will come through Thursday afternoon and again, could bring a few flurries late Thursday into Friday. The third clipper, still well off in the northern Pacific, is forecast to move through Friday afternoon. The latest suite of numerical guidance was suggesting enough moisture with this system to produce some snow, potentially accumulating, across southern Wisconsin and northern Illinois by Friday night. In fact, the NAM model was giving us a little over two inches while the GFS was giving us a little over three inches. Keep in mind this forecast will likely change over the next 48 hours once the low moves onshore. Stay tuned! Here's a look at how the winter of 2011-12 stacks-up against our mildest winters so far. Our average temperature (highs and lows together) so far is 29.8. If this winter ended tonight, we'd place 6th in Rockford's all-time mildest winters! Here's a look at current snow depth across the region. The Rockford area is sitting in the 2-4" range, with Freeport and much of the northwestern part of the state at 4-8". 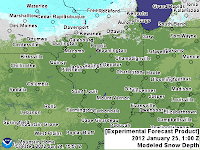 However, just to our south and east there is no snowcover in the Chicago metro area and along the I-80 corridor. With temperatures at or just above freezing over the next couple of days during the afternoon, the snowcover will slowly decay. As it does so, we may see snow-free areas several degrees warmer than areas with snow. (This is because snow reflects sunlight and insulates the air from the relative warmth of the ground.) This impact would be most noticable in the afternoon. The current solar storm has produced some amazing displays of the northern lights. This video was captured in Norway! Strong low pressure just east of Lake Superior continues to cause brisk winds across the Stateline early this evening. The wind will slowly ease up, but it will remain cloudy for most of the night. The overnight low will be in the mid to upper teens. Canadian high pressure will settle into the area on Tuesday. It will be chilly with highs around 27 degrees, but it will become mostly sunny in the afternoon. It will be cold overnight on Tuesday night with a low near 10 degrees under partly cloudy skies. High pressure will shift to the east on Wednesday, the wind will shift to the south,and temperatures will recover into the low 30's under partly sunny skies. On Thursday, the next fast moving Pacific system to affect the area, will push through in morning. It will have little affect on the weather across northern Illinois. Skies will become mostly sunny after frontal passage, and high temperatures will be in the middle 30's. A large sprawling type of Pacific high will nudge into the Pacific northwest on Friday, it will be partly sunny here with a high again in the middle 30's. Low pressure will intensify over James Bay in Canada by early Saturday. The large Pacific high will be centered over the Rocky Mountains, and a trough of low pressure will sweep across Wisconsin and Illinois early in the day. The circulation and pressure gradient set up between the high to the west and the low to the north will cause a gusty northwesterly wind to develop tapping some colder Canadian air. Temperatures by early Sunday will be in the low teens, and the high on Sunday afternoon will only reach the low 20's. Another in a series of fast moving systems will approach on Sunday night and Monday warming temperatures a bit, and bringing a chance of snow back to northern Illinois. 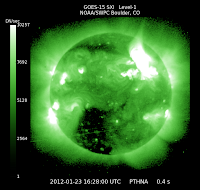 It could be one of the biggest solar storms since May 2005. 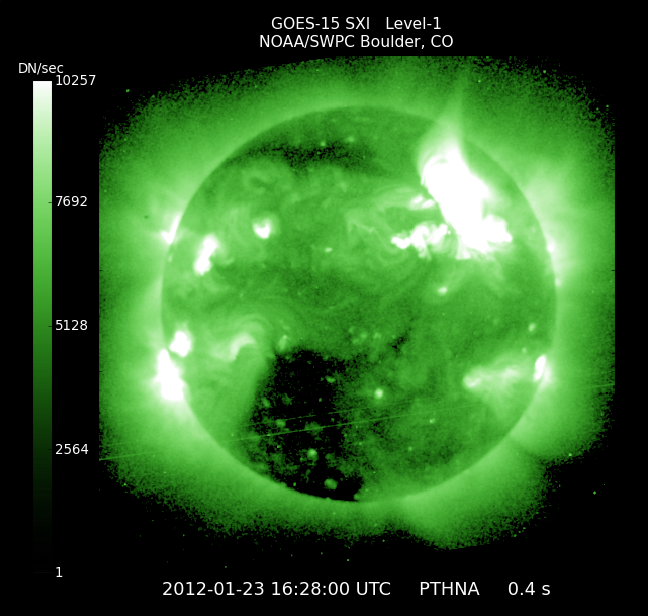 That's according to the National Weather Service Space Weather Prediction Center. The associated earthward directed Coronal Mass Ejection is anticipated to arrive around 9am EST (8am CST) Tuesday, January 24th. Because of this the SWPC has issued a Geomagnetic Storm Watch with G2 level storming likely and G3 level storming possible. Click here to learn more! This could have impacts on navigation, power grids and satellites! A split flow pattern within the jet stream this week will keep active weather in the south and several disturbances moving across the north. Once we've finished with this low that brought storms as close to us as Ogle county, high pressure will move in Tuesday helping clear our skies. A cut-off low will begin to develop late Tuesday in the southwest and move into Texas Wednesday before lifting east Thursday. This cut-off low could bring a few active storms across southern Texas Tuesday and and then again Wednesday. Closer to home, the northern branch of the jet stream will keep a few systems coming in from the Pacific northwest. While there are no major storms in the forecast for us, a cold front coming through Wednesday night/early Thursday and then again Friday into Saturday will keep the light snow/rain mix in the forecast. By this weekend the two branches will have merged together forming a trough over the Midwest. This will keep the weekend breezy and cooler with highs in the middle 20s. Severe weather started Sunday evening and lasted through the overnight and into Monday morning in the south. In fact, that same storm brought thunderstorms to parts of north-central and northeast Illinois very early this morning. The storm will continue to push a cold front into the southeast as the tornado threat continues into the afternoon. A preliminary count of 21 tornadoes were reported Sunday with a few more this morning. Some of the same locations that were hit with tornadoes last April dealt with the storms again and sadly there have been a few fatalities reported this morning. Storms that form out of season like this can often times be very destructive. Remember back in January 2008 the Poplar Grove tornado and then again November 2011 in Calendonia. Storms could fire up again tomorrow and Wednesday as another low pressure system moves across Texas. 7:30am Update: Current visibility this morning is still below one mile in many locations. A Dense Fog Advisory continues for Green, Rock, Walworth, Winnebago, Boone, McHenry, Ogle, Lee and DeKalb counties until 9am. Gusty northwest winds later this morning should help mix out some of the fog. Drizzle and even light rain showers will persist through the morning before switching over to light snow late this morning and into the afternoon. Accumulations shouldn't be much, maybe half an inch to one inch. Give yourself extra time this morning as visibility will rapidly change while driving. 6am Update: The Dense Fog Advisory for Stephenson, Jo Daviess, Carroll and Whiteside counties has been allowed to expire. The advisory ran through 6am for our western counties. Increasing winds has helped visibility improve to a mile or so across the region. As winds pick up this morning visibility will gradually improve. A Dense Fog Advisory continues for southern Wisconsin and northern Illinois through 9am. Even though the advisory lasts until 9am expect the fog to continue through mid-morning. Visibility in many locations has fallen to less than a half mile; especailly in outlying, rural locations. Southerly winds continue to transport a warm, moist air mass over a fresh snow pack this morning. Combine that with the rain showers overnight and locally dense fog has developed. The fog will last through mid to late morning and then winds will shift to the west/northwest pulling in a little drier air mass. Temperatures this morning are in the upper 30s and lower 40s but are expected to drop into the upper 20s and lower 30s by late this afternoon. Winds could gust as high as 35-40mph later today. Low pressure is over north central Missouri with a warm from stretching eastward across central Illinois. There is a southerly wind across Illinois causing widespread drizzle and fog. The low will move toward the northeast overnight, and be positioned over eastern Iowa at midnight, and near Milwaukee by 6 am on Monday. Rain showers will spread across the area from southwest to northeast. Because of the warm air associated with the system moving across cold snow covered groung, drizzle will continue, and fog will thicken becoming locally dense. Temperatures will hold in the middle 30's overnight. Colder air will begin moving into the Stateline around daybreak, the fog will dissipate, and rain showers will mix with snow. Temperatures will drop from the middle 30's early to near freezing at noon changing the mix to all snow. The winds will pick up from the northwest to 20-30 mph by noon with gusts to 35 mph. Minor accumulations of around 1" are expected during the afternoon, and there will be blowing snow with strong winds continuing into Monday evening. There could still be a few flurries in the evening, winds will slowly subside overnight, and it will be colder with temperatures dropping into the middle teens by daybreak on Tuesday. Tuesday will be mostly sunny with a high in the middle 20's. High pressure will dominate the area on Wednesday, and temperatures will moderate back into the low 30's by afternoon. A Pacific system will move through the area early Thursday. The air behind it is actually warmer, so the high will be in the middle 30's under mostly sunny skies. That Pacific high will be over Ohio by early Friday, and another Pacific front will be approaching by late in the day, so there will be a slight chance of rain or snow with that system in the late afternoon. Even though the next high pressure is Pacific in origin, it will pull down some colder Canadian air on it's nose, so temperatures will be a little colder on Saturday and Sunday. Update: A Winter Weather Advisory has been issued for Green and Rock county until 8pm and for Winnebago, Boone, Ogle, Lee and DeKalb counties until 6pm. Freezing drizzle is developing across the area this morning and could put down a light glaze on roadways; especially untreated roads. Temperatures remain below 32° so going into the afternoon freezing fog and even light freezing rain could develop. Winds are blowing from the southeast close to 20 mph, or higher, so blowing and drifting snow will be found in the open and rural locations. Use extra caution when traveling because there will likely be a few slick spots. A Freezing Rain Advisory has been issued for Jo Daviess, Stephenson, Carroll and Whiteside counties through 6pm this evening. FREEZING DRIZZLE WILL CONTINUE TO DEVELOP ACROSS THE AREA THIS MORNING AND BECOME WIDESPREAD. THE FREEZING DRIZZLE MAY THEN TRANSITION TO LIGHT FREEZING RAIN THIS AFTERNOON IN AREAS NORTH OF INTERSTATE 80. SOME ICING IS LIKELY ON UNTREATED ROADS...SIDEWALKS...AND OTHER EXPOSED SURFACES. MOTORISTS SHOULD ANTICIPATE SLIPPERY TRAVEL...ALLOWING FOR EXTRA STOPPING DISTANCES AND TIME TO REACH THEIR DESTINATIONS. PEDESTRIANS SHOULD ALSO BE ON THE LOOKOUT FOR ICY SIDEWALKS. FREEZING DRIZZLE WILL CONTINUE THIS MORNING AND BECOME MORE WIDESPREAD AS THE DAY PROGRESSES. THE FREEZING DRIZZLE MAY THEN TRANSITION TO MORE OF A LIGHT FREEZING RAIN IN AREAS NORTH OF INTERSTATE 80 THIS AFTERNOON. UP TO 1/10 OF AN INCH OF ICE ACCUMULATION IS POSSIBLE ON EXPOSED AND UNTREATED SURFACES. TRAVEL COULD BECOME HAZARDOUS AS THE DAY PROGRESSES...WITH ICY SPOTS DEVELOPING ON SOME ROADWAYS...PARKING LOTS...SIDEWALKS AND OTHER EXPOSED SURFACES. MOTORISTS SHOULD ANTICIPATE SLIPPERY TRAVEL...ALLOWING FOR EXTRA STOPPING DISTANCES AND TIME TO REACH THEIR DESTINATIONS. Arctic high pressure which has shifted off to the east. The Stateline has had 4 days in a row with below average temperatures. That has not happened since the last week of October when Rockford recorded 6 days in a row below average. With the high pressure shifting off to the east, temperatures will hold steady in the middle teens tonight, and may rise a few degrees toward daybreak. With milder air from the plains, and lower Mississippi Valley overrunning the retreating cold air, there could be some freezing drizzle on Sunday morning. Temperatures should rise above freezing by 1 pm on Sunday ending the freezing precipitation threat. There could be a little light rain or drizzle on Sunday afternoon as temperatures rise into the middle 30's. There will be a brisk southerly wind on Sunday from 15-25 mph with some gusts to 30 mph ahead of low pressure over the central plains. Light rain will be likely on Sunday night, and with warmer air continuing to stream over the snow covered ground, fog will be possible, and it could become locally dense. Areas to the north and west of Rockford will probably see wet snow mix with the rain and change over to all snow before daybreak. Accumulations in that area are expected to be minimal, generally less than an inch. On Monday, with strong low pressure pulling away toward the northeast across Wisconsin and Lake Michigan, it will be windy with some light snow. Again, accumulations are expected to be minimal. Winds will be northwesterly at 15 to 30 mph bringing colder air back into the Stateline. Temperatures will fall from the low 30's in the morning into the 20's during the afternoon. A bubble of Canadian high pressure will clear skies on Monday night, and drop temperatures into the middle teens. Tuesday will be mostly sunny and chilly with a high in the upper 20's. By Wednesday morning the chilly high will be off to the east and a warmer pattern will set in across the mid west for the rest of the week. Highs will generally be in the middle 30's, and lows will be in the low to middle 20's for the rest of the work week. No significant weather systems are expected. THE WINTER WEATHER ADVISORY. SNOW HAS ENDED AND WINDS WILL REMAIN LIGHT THE REST OF THE NIGHT. (1:38:16 PM) nwsbot: MKX: 9 Wnw Beloit [Rock Co, WI] trained spotter reports SNOW of M2.0 INCH at 01:15 PM CST -- snowfall rate is approx 1 inch per hour currently. (1:34:02 PM) nwsbot: LOT: Marengo [Mchenry Co, IL] public reports SNOW of M1.5 INCH at 01:26 PM CST -- storm total so far. relayed by wtvo. (12:28:48 PM) nwsbot: LOT: De Kalb [De Kalb Co, IL] public reports SNOW of E1.0 INCH at 12:23 PM CST -- estimated storm total so far. moderate to heavy snowfall at time of report...with 1/2 mile visibility. (12:29:00 PM) nwsbot: DVN: 2 Wnw Freeport [Stephenson Co, IL] trained spotter reports SNOW of M1.9 INCH at 12:25 PM CST -- so far. still snowing heavily. st47. (12:16:15 PM) nwsbot: LOT: Amboy [Lee Co, IL] law enforcement reports SNOW of E1.5 INCH at 12:05 PM CST -- estimated storm total so far. roads snow covered. 1/2 mile visibility in moderate to heavy snow at time of report. (12:16:15 PM) nwsbot: LOT: Amboy [Lee Co, IL] trained spotter reports SNOW of M1.5 INCH at 12:08 PM CST -- estimated storm total so far. 1/2 to 3/4 mile visibility in moderate snow at time of report. (11:09:40 AM) nwsbot: DVN: Galena [Jo Daviess Co, IL] public reports SNOW of E1.8 INCH at 11:06 AM CST -- moderate to heavy snowfall. 12:45pm Update: Winter Storm Warnings continue for Jo Davies, Stephenson, Carroll, Whiteside, Winnebago, Boone, McHenry, Ogle and DeKalb counties. Winter Weather Advisory for Green, Rock and Walworth counties in southern Wisconsin and for Lee county in Illinois. Moderate to heavy snow continues over north-central Illinois with a heavy snow axis just south of Highway 20 and extending into eastern Iowa. So far, totals have been near an inch to two inches and will continue to steadily climb through the afternoon before slowly coming to an end by this evening. 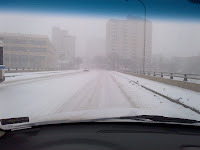 Roads are snow covered and traffic has been moving slowly across the area. Still sticking with my 6" area wide with locally higher totals where the heavier bands of snow set up. Either way, visibility has come down significnatly and roads are snow covered so conditions for the rest of this afternoon and evening will continue to worsen. Visibility has significantly gone down across Rockford via our SkyTrack camera. Heavy snow moving through the Rockford Metro - up to the Wisconsin/Illinois border and down through Rochelle. Visibility down to less than half a mile. 10:30am Update: Snowfall rates are beginning to pick up across western Illinois this morning. Heavier snowfall is occurring across northeast and north-central Iowa this morning and the snow will continue to slide east/southeast through noon. Roads are already snow covered so watch for slick spots. 9:40am Update: Light snow is now moving in west of I-39 and will continue to move east. There is a moderate to heavy band of snow falling near Dubuque south through Jo Daviess, Carroll and Whiteside counties. Within this band of heavier snow visibility has been reduced to a quarter mile or less and snowfall rates are near half an inch to one inch per hour. Accumulations could be near one to two inches by Noon across northwest Illinois. 8:15am Update: If you were to just look at the current radar image across northern Illinois and southern Wisconsin you would expect to see snow outside. If you were to step outside right now you would notice we don't have a whole lot of anything except bitter cold! Our atmosphere this morning is extremely dry with dew points well below zero. Snow has just recently been reported in Dubuque, IA even though the radar showed it snowing there for some time this morning. As the snow falls through the dry atmosphere it evaporates. You can tell by looking at the clouds that there is some moisture in them by the way their color is - we're just not seeing it yet at the surface. It will take some time before the atmosphere saturates before we see some snow. So your travel this morning will be okay, just VERY cold! A Winter Storm Warning continues for Jo Daviess, Stephenson, Winnebago, Boone, McHenry, Ogle and DeKalb counties through this evening. A Winter Weather Advisory remains for Green, Rock and Walworth counties in southern Wisconsin as well as for Whiteside and Lee counties in Illinois. Looks like the heaviest snow bands may set up right along the Highway 20 corridor this afternoon and evening. A boundry drapped across the area and an upper level low will become the focus for snowfall later today. Snow has been reported across Iowa this morning with reports of one to two inches falling so far. Even though the radar is showing snow across the region, probably a lot of it isn't reaching the ground just yet as dew points are well below zero. I anticipate the snow to move into northwest Illinois after 7am and spread east through mid-morning; hitting Rockford around 9am. The snow will start off light but increase in intensity during the afternoon and evening. Your morning commute should be fine, just cold! It's later today and tonight that travel may become tricky and slick. Snowfall totals area wide will likely top out around 5"-6", however, as some of the heavier bands begin to set up the rate at which the snowfall comes down may cause totals closer to 7" or even 8". Going into the afternoon we'll have to pay very close attention to just where this moderate band of snow sets up and what the snow to liquid ratios are. Some of the latest weather guidance has suggested the storm speeding up this afternoon which could cut down on totals. Updates will continue to be provided right here so be sure to keep checking back! FRIDAY. THE WINTER WEATHER ADVISORY IS NO LONGER IN EFFECT. MORNING INTO THE MID AFTERNOON HOURS. * ACCUMULATIONS...SNOWFALL TOTALS OF 5 TO 8 INCHES CAN BE EXPECTED. DISRUPTIONS TO AIR TRAVEL AS WELL. At left is a graphic showing predicted snow totals. The new model runs are just now coming out and it appears that 3-6" is too conservative for most areas. Now it looks more like 5-8", with lesser amounts south of Rochelle. The snow will begin in Freeport around 8:30am, and quickly spread to the east so that all of the area is getting snow by about 10am. It appears that the heaviest snow will fall in the middle of the afternoon. This will -- of course -- make the ride home from work tricky. Fortunately, winds should generally be less than 10 mph, which will minimize blowing and drifting snow. CST FRIDAY. THE WINTER STORM WATCH IS NO LONGER IN EFFECT. FRIDAY AND CONTINUE THROUGH THE DAY ENDING DURING THE EVENING. WITH LOCALLY HEAVIER TOTALS POSSIBLE. RESULT IN SIGNIFICANT DISRUPTIONS TO AIR TRAVEL AS WELL. Mother Nature has her 'one..two' punch ready to go for the next 36 hours. Even though we had a little light snow early this morning, the bigger story for this afternoon is the cold. Temperatures area wide are in the single digits and wind chills are close to -10°F to -15°F! I made the mistake of not wearing gloves when walking from my car to the station and my fingers are still trying to thaw! The clouds are beginning to thin late this morning and aren't expected to move back in until late tonight. With the lack of cloud cover in place and already falling temperatures I believe we have a real good shot of lows falling below zero once the sun sets tonight. Be prepared! Now, if the cold wasn't bad enough we've got potentially some significant snow to deal with for Friday's storm. After looking through some of the newest data this morning, it still appears likely that the heaviest of the snow will set up along the Wisconsin/Illinois border. It's in this locations totals could near well over 6"-8" of snowfall. Winter Storm Watches continue and will likely be left for the remainder of the day. There has been some talk from the weather service to possibly upgrade to an Advisory or Warning later this evening or heading into Friday. Timing: it still appears as if the leading edge of the snow will begin to move in to northwest Illinois around 7am and spread east through the morning. The heaviest of the snow will fall during the afternoon and evening. Evening commuters may have a very slow ride, especially if one inch per hour snowfall rates are realized. This will make keeping up with clearing the snow difficult. Also, the effectiveness of salt goes down as the temperature decreases and with temperatures expected in the teens during this event this may also make it harder for road crews to keep up. Stay with the First Warn Weather Team for all the latest information! We'll continue to post information as we receive it here on the blog, as well as facebook and twitter. Yikes! Now that is cold! This image is a surface plot of the Midwest from about 7:45am. The lines represent wind speed and direction, temperatures are the red numbers and dew points are the green numbers. The colored circles that you see around the Great Lakes indicate current sky condition and cloud cover. What I want you to look at are the sub-zero temperatures across the upper Midwest! A very cold Arctic high pressure sits across the Dakotas this morning and with clear skies temperatures have fallen to as cold as -20°F in many locations! What's even worse is the wind. There is a departing area of low pressure on the other side of the Great Lakes and the difference in pressure between the two has caused a few gusty winds early this morning. Wind chills in some locations have fallen to as cold as -40°F!!!! Extreme Cold Warnings have been issued for Minnesota, all of North Dakota and northeastern South Dakota for today. Northwest winds will continue to pull down that cold air mass keeping temperatures in the single digits here for this afternoon! A Winter Storm Watch has been issued for southern Wisconsin and northern Illinois beginning Friday morning and lasting through Friday night. An arctic cold front continues to move east this morning pulling very cold air in behind it. In fact, temperatures will fall into the single digits by this afternoon with possible wind chills as cold as -15°. A few flurries and even light snow showers will persist through the morning before partial clearing occurs later this evening. The little clearing we'll experience tonight will allow temperatures to drop quickly before holding steady as clouds move back in. The storm that we're watching for Friday is just now entering into the Pacific Northwest. As it stands right now (keep in mind some of this will change) the snow could start as early as 6am or 7am and intensify throughout the morning and into the afternoon. It looks like the heaviest of the snow may come very late in the morning and through the afternoon; this is when the best forcing in the atmosphere will arrive. Temperatures will be in the teens during this event which will cause the snow to be fluffy. Snow to liquid ratios could be as high as 15 or 18:1. With total precipitation amounts nearing 0.40", snow totals could be between 6" or 8". One important thing to keep in mind with this storm is that it is now just entering into the U.S. so we'll be able to get a better data sampling as it continues to push onshore. We'll continue to provide updates here on the blog, as well as facebook and twitter. There are no winter storm watches yet, but I wouldn't be surprised to see the National Weather Service issue one within the next 12 to 18 hours for the Stateline area. We're anticipating an area of low pressure to move out of the central Plains on Friday and through southern Illinois late Friday afternoon into Friday night. On this track, we'll have warmer air aloft riding up and over the Arctic air that we'll have at the surface. This rising motion -- along with ample moisture -- is likely to produce a significant snowfall in or very near the Stateline area. The graphic above shows 12-hour liquid equivalent totals (forecast) across the US and southern Canada. That orange bulls eye in Iowa indicates up to 0.75" of liquid-equivalent precipitation falling late Friday afternoon and Friday evening. That would "fluff-up" to well over a foot of snow for that area! Here in the Stateline, I'm thinking we'll see somewhat lesser amounts of liquid-equivalent. Also, the exact track and strength of this low is still questionable since it's still not made it onshore from the Pacific Ocean. Nonetheless, a snowstorm with more than 6" of accumulation is looking more likely for us late Friday into Friday night. Stay tuned! This is What Winter Is Supposed to Be Like! Arctic air from Alaska and Canada has settled into the Stateline. Temperatures in and around Rockford were the coldest they have been so far this winter dropping below zero in Belvidere, Harvard, Monroe, and Galena. The unofficial low at the Rockford airport was 2 degrees. It has not been that cold in Rockford since February 11th of 2011. The cold ridge of high pressure stretches from Lake Superior across Wisconsin, Illinois, Missouri, and Arkansas into Texas. It will shift to the south and east today as the next weather system over the northern plains moves into the mid west this evening. A fairly strong pressure gradient will allow for brisk southwesterly winds to develop by afternoon gusting above 25 mph. Skies will be mostly sunny today becoming partly cloudy later this afternoon with a high in the low 20's. The front will push southeast across northern Illinois between 1 am and 3 am early Thursday. It will be breezy with a chance of a little light snow or flurries overnight. The low will be near 6 degrees, but with the inflow of fresh arctic air on Thursday temperatures will not rise much, and the afternoon high will be around 8 degrees. Wind chills are expected to be -5 to -15 in the early morning hours. Arctic high pressure will settle into the area on Thursday night, and temperatures will drop to near zero or a little below. Only an increase in clouds from the next system approach from the west will keep temperatures from dropping even lower. On Friday it appears as if there will be a good set up for accumulating snow. Warmer air with a fair amount of moisture will over-run the slowly departing arctic air mass causing snow to develop. Although there does not appear to be low pressure development at the surface, there will be good mid & upper level support. Clipper like (dry) snow will spread across the area on Friday. Snow to water ratios will probably be at least 20:1 and may end up even higher. So our area could easily pick up 4" of fluffy (dry) snow, possibly more. We will be watching this system closely for you. The snow is expected to end on Friday evening, and high pressure will follow in behind the departing system on Saturday bringing our area mostly sunny skies. Temperatures will still be chilly, reaching the low 20's in the afternoon. Forecast confidence decreases later into the weekend and early next week with another pattern shift apparently taking place. It will be milder with temperatures reaching into the middle 30's allowing for any precipitation that occurs to be a rain/snow mix. No major systems are anticipated early next week. 2:55pm Update: The Snow Advisory for the Stateline area has now been cancelled by the National Weather Service. Although the NWS has us under a winter weather advisory until 9pm, it appears that the snow is mainly over. Recent radar trends show the back-edge of the snow pushing to our east and falling apart. Therefore, I only expect flurries at most for the remainder of the afternoon. However, many roads will remain slick for your afternoon commute and strong northwest winds could cause some blowing and drifting of snow. Therefore, travel will still be tricky and you should allow some extra time to reach your destination. (10:35am) LOT: Machesney Park [Winnebago Co, IL] public reports SNOW of M2.0 INCH at 10:30 AM CST. (9:39am) DVN: 2 Wnw Freeport [Stephenson Co, IL] trained spotter reports SNOW of M1.2 INCH at 09:36 AM CST — total so far. still coming down pretty good. (9:39am) DVN: 4 Ese Galena [Jo Daviess Co, IL] trained spotter reports SNOW of E2.0 INCH at 09:37 AM CST — total so far. heavy wet snow. (9:20am) LOT: 4 Nw Rockford [Winnebago Co, IL] co-op observer reports SNOW of M1.0 INCH at 07:00 AM CST — storm total so far. (9:20am) LOT: 5 Nw Woodstock [Mchenry Co, IL] co-op observer reports SNOW of M1.0 INCH at 07:00 AM CST — storm total so far. (9:20am) LOT: 2 N Spring Grove [Mchenry Co, IL] co-op observer reports SNOW of M0.5 INCH at 07:00 AM CST — storm total so far. (9:20am) LOT: 1 Nw Rockford [Winnebago Co, IL] cocorahs reports SNOW of M0.4 INCH at 07:00 AM CST — storm total so far. (9:19am) LOT: 3 N Byron [Ogle Co, IL] cocorahs reports SNOW of M0.4 INCH at 07:00 AM CST — storm total so far. (9:19am)LOT: 1 Ese Rockton [Winnebago Co, IL] cocorahs reports SNOW of M1.1 INCH at 07:30 AM CST — storm total so far. (9:18am) LOT: 2 Wnw Bull Valley [Mchenry Co, IL] cocorahs reports SNOW of M0.4 INCH at 08:00 AM CST — storm total so far. (9:18am) LOT: 3 Ne Rockford [Winnebago Co, IL] cocorahs reports SNOW of M0.4 INCH at 08:00 AM CST — storm total so far. (9:15am) DVN: 4 Nnw Lanark [Carroll Co, IL] trained spotter reports SNOW of M0.8 INCH at 09:10 AM CST — also low visibility due to blowing snow. (9:01am) DVN: Wnw Mount Carroll [Carroll Co, IL] co-op observer reports SNOW of M1.0 INCH at 08:45 AM CST — corrected source. 24 hour total. mtci2 coop. (8:58am) LOT: E Harvard [Mchenry Co, IL] cocorahs reports SNOW of M0.7 INCH at 08:00 AM CST — storm total so far. light snow falling at time of report. 9:00am update: Moderate band of snow moving through northwest Illinois. Temperatures continue to fall this morning with the passage of the low. Reports of around an inch of snow have come in so far...some locations have been reporting a little sleet mixed in as well. Several reports of slick roads have come in across northern Illinois. The snow will continue into the afternoon before tappering to flurries by this evening. Totals still looking to near 3" in some locations. A mixture of snow and even some freezing rain were being reported this morning as a deepening area of low pressure continues to slide south of the Stateline. The snow will continue to overspread the region with snowfall rates up to half an inch per hour possible. Totals still look to range between 1"-3", however, gusty northwest winds will blow around the snow throughout the day so blowing and drifting will remain a concern until this evening. Roadways are slick this morning and there have already been reports of blowing and drifting taking place; especially in the open areas. Use extra caution this morning and leave yourself plenty of time to get where you need to go. As Meteorologist Candice King said in a previous post, travel could be tricky tomorrow morning. Although the radar is still looking pretty quiet at this time, a deepening area of low pressure in western Illinois will continue to pull-in moisture toward the area. Our computer models are suggesting that the heaviest precipitation will fall sometime between 5am and noon, just in time to make your morning commute slippery! When the precipitation first begins, we could see some minor ice accumulations with light freezing rain. This will quickly change over to snow by about 6am. Right now it looks like 2-3" of snow will fall in most spots, with a few areas to the north of Rockford seeing 4". The snow on top of any ice accumulation will make things deceptively slippery to both motorists and pedestrians. So please be careful out there! 11am Update: The breaks in the high based cloud cover early this morning have allowed temperatures to rise into the upper 30s, so it's possible we may hit 40° this afternoon. The difference between the temperature and dew point continue to increase so this will likely keep the fog development low for this afternoon. Some drizzle or even a few light rain showers will be possible later this afternoon and evening as a cold front passes. Temperatures today will range from the upper 30s/low 40s under mostly cloudy skies. Once the front passes later this evening an area of low pressure will move in from the southwest overnight and pass just south of Chicago by daybreak Tuesday. With temperatures in the upper 30s for the majority of the day any precip that does fall should remain in the liquid form. Tonight, however, could be a different story. Temperatures at the surface will likely fall into the upper 20s/low 30s overnight as winds shift around to the north/northeast. Southerly winds will continue a few thousand feet above providing a relatively warm layer aloft so any precipitation that falls through that layer will remain liquid. As it gets closer to surface it will be falling through a layer that is very close to 32°F (0°C) and this could cause the drizzle/light rain to freeze upon reaching the surface. This image is a forecast sounding from the National Weather Service's GFS for midnight tonight. Notice how winds around 850mb and up remain from the southwest but then shift to the northeast below 850mb. The northeasterly component to the wind will keep temperatures at the surface cooler than above allowing any precipitation that falls through that layer to potentially freeze upon reaching the surface. One thing of note: the atmosphere will remain fairly saturated in the lowest levels so should any freezing drizzle/rain form overnight it shouldn't last too long and we're not expecting major ice accumulation. There could be a few slick spots, though, for your early morning commute. Low pressure will slide just south of Chicago by daybreak Tuesday with cold air moving in behind it. This will change over any mixed type of precipitation to all snow by Tuesday morning. Depending on how quickly the snow falls and how fast the changeover is, there could be some accumulations by Tuesday evening. As of right now it looks like anywhere between 1"-3" could fall area wide. Winds will be gusty from the northwest and temperatures will go from the upper 20s in the morning down to the lower 20s by the afternoon. Just often has this late of a snowfall occurred? Near record warmth? It will be close for some! Cold blast felt across much of the U.S.